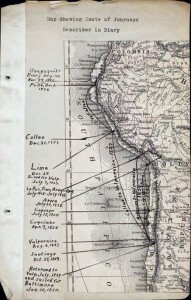 Drexel University Archives and Special Collections MC.00.001, Box 18, Folder 2, Journal of a Trip to South America, by Drexel, Francis Martin, 1792-1863 (Peru Ecuador Bolivia Chile, 1826 – 1830). The pilot phase of the PACSCL Diaries Project contains 53 diary volumes from 13 member repositories. The interface on this site draws from images and metadata hosted at OPenn. The data on OPenn is intended for aggregators, digital humanists, and scholars who have been directed to the site to procure high-resolution images of manuscript pages. It is presented in a manner most likely to ensure its long-term digital preservation. Users are welcome to download any or all of the images using anonymous ftp or anonymous rsync. A full list of the diaries on this site, accessible via user-friendly page-turning interfaces as well as OPenn, can be accessed here. (View Diaries)T he Bryn Mawr College Special Collections includes rare books, manuscripts, the college archives, works of art on paper, and ethnographic and archaeological objects. The rare book collection contains approximately 50,000 volumes, and includes extensive collections of late medieval and early modern works, among them more than 100 medieval manuscript volumes and more than 1000 15th century printed books. In addition, there are strong collections on the history of women, European interaction with Asia, Africa and the Americas, and British and American literature.The manuscript collections are particularly strong in women’s history, including the papers of Bryn Mawr president and early women’s rights activist M. Carey Thomas; papers of many prominent women associated with Bryn Mawr, including poet Marianne Moore, New Yorker editor Katharine Sergeant White, artist Anne Truitt, and archaeologists Lucy Shoe Meritt and Dorothy Burr Thompson; and extensive collections of letters and diaries written by Bryn Mawr students from the time of its founding in the 1880s. These collections are supported by a graphics collection ranging from the 15th century to the present, including 7,300 prints, 3,500 drawings, and 13,000 vintage photographs.Documents from Special Collections, Bryn Mawr College. Drexel University Archives collects records created by Drexel University’s administrative offices and academic departments from 1892 to the present including reports, minutes, correspondence of Drexel faculty, administrators, and staff, as well as Drexel-produced publications. The Drexel University Archives’ holdings primarily consist of institutional documents created by members of the Drexel community and maintained by the Archives as a record of the University’s activity. Our archival collection includes: papers, documents, electronic files, photographs, videos, cassettes, film, financial records, letters, blueprints, slides, and other materials relating to Drexel University. Our manuscript collections include papers that document individuals affiliated with Drexel, such as the personal papers and correspondence of faculty and alumni, as well as materials related to the Drexel family, late-19th century Philadelphia, and records of professional library associations. The majority of rare books in Special Collections were donated by George M. Standish as well as those donated by Anthony J. Drexel and his business partner, George W. Childs. The Drexel University College of Medicine Legacy Center supports research and investigation of the history of women in medicine, history of homeopathic medicine in the United States, and the history of women’s health. Our collections are accessible online and in our reading room in Philadelphia. We work regularly with K-12 students and teachers, graduate and undergraduate students, scholars, and genealogists.The Center is the repository for records documenting the history of the College and its predecessor institutions, including Woman’s Medical College of Pennsylvania and Hahnemann University. Special collections emerging from these institutions’ unique and original missions to educate women physicians and to teach homeopathy reflect the activity of individuals, institutions, and organizations. Over 4,000 linear feet of materials date from 1502 to the present, with the bulk of the materials ranging from 1848-1990. Founded in 1764, The German Society of Pennsylvania is America’s oldest German organization. Its Joseph P. Horner Memorial Library, housed in a beautiful 19th century reading room, holds one of the largest private collections of German-language books in the U.S. The German American Collection contains a wealth of material documenting all aspects of German American life, beginning with the first settlers in Germantown in 1683. In addition to books, the library houses sizable collections of 19th century Philadelphia German newspapers, periodicals, pamphlets, and manuscripts. Quaker & Special Collections contains Haverford College’s include the world-renowned Quaker Collection, College archives, rare books and manuscripts, and fine art. We seek to collect, preserve, and make available materials which serve the research and teaching needs of the Haverford community as well as the wider scholarly community. Our world-renowned Quaker collections, which illuminate Quaker life, faith, and practice from the earliest days of the Society of Friends to the present day in many parts of the world. Materials include early books and pamphlets, meeting records, organization and family papers, journals and diaries, English and American Quaker serials, and audio-visual materials. Archival holdings document the history and operations of Haverford College from its founding in 1833 to present. Other strengths include literature (particularly Shakespeare and the work that influenced him), natural history, science, American History, and a small but interesting collection of 13th- through 19th-century illuminated manuscripts in Hebrew, Latin, Arabic. Our photographic holdings document the history of photography and photographic technology, and include prints by many of the greatest 19th and 20th century photographers, while prints, paintings, and artifacts complete the art collections. The collections are open to all. Independence Seaport Museum’s J. Welles Henderson Archives and Library is one of the nation’s premier regional maritime research facilities. With a rich repository of regional documents, 12,000 ship plans, a significant collection of rare books and manuscripts; maps and charts; photographs, and a 15,000 volume research library, the J. Welles Henderson Archives and Library boasts an impressive range of materials. The collections are dedicated to a deeper understanding, appreciation, and experience of Philadelphia’s regional waterways and the Delaware watershed area for everyone, they carry national and international significance. The principal treasure of the department is its unique archival collections: the letters, diaries, logs, business, financial and legal papers, plans, drawings, ephemera, photographs, photograph and scrapbook albums of sailors and captains (and their families), shipbuilders, sail makers, merchants, nautical instrument makers, social welfare organizations, insurers, explorers, travelers, architects, rowers, fishers, naval surgeons, and marine artists, dating from the seventeenth century to the present. Such collections are of interest to scholars of not only maritime history, but also economic, technological, scientific and social history as well. Lehigh University Libraries, Special Collections (View Diaries)Lehigh University Libraries, Special Collections serves as the repository for the University’s collections of rare books and manuscripts, and for holdings relating to its own history. It encompasses a rare book collection of over 25,000 volumes, with first editions of English and American literature from the 17th to the 19th centuries, strengths in travel and exploration, natural history and ornithology, and works of historical significance in science and technology. Materials relating to the University include documents and publications of the University, papers of faculty members, and memorabilia from the University’s history. In addition, Special Collections is the repository for Lehigh theses and dissertations. Holdings in the history of technology concentrate on large scale construction, including a number of classic and seminal works on bridge building and design, and construction with iron and steel. Special Collections also holds manuscripts and personal papers, in addition to papers relating to the University’s history. The Lutheran Archives Center at Philadelphia is the Northeast Regional Archives (Region 7) for the Evangelical Lutheran Church in America (ELCA). It is a part of a network of nine regional archives programs and a national level (church-wide) archives in the ELCA. Our service area is limited to Eastern Pennsylvania, New Jersey, Upstate New York (excluding the Metropolitan New York City area) and New England. We carry on the work of our predecessors in the first Lutheran Church organization in America, the Evangelical Lutheran Ministerium of Pennsylvania and Adjacent States, founded on August 15, 1748 by Henry Melchior Muhlenberg. The Archives was recognized as a part of the church organization in 1792. The Archives has been housed on the campus of the Philadelphia Seminary since 1889 as is located in the undercroft of the new Brossman Learning Center. The Archives collections are now completely contained in a large vault area with compact shelving, now better organized. A reference library room provides books frequently used, as well as space for researchers to work in comfortable surroundings. The Archives office is across the hall. The Seminary has provided the new space for the present and future. Collections include personal papers of Lutheran clergy, theologians, and church workers; archives of church organizations; and records of congregations. The State Library of Pennsylvania collects and preserves the written heritage of the Commonwealth through materials published for, by, and about Pennsylvania. The strengths of the Rare Collections Library include Pennsylvania imprints, government documents, original newspapers, pamphlets, maps and atlases, and rare works of Pennsylvania religion, natural history, and genealogy. The core of the Rare Collections Library is the Assembly Collection, numbering over 400 volumes. These books were purchased by Pennsylvania’s legislators beginning in 1745 to serve their needs in crafting legislation and governing the Commonwealth. Comprised largely of law books, the Assembly Collection also contains dictionaries, books on architecture, philosophy, history and religion. At the center of the Assembly Collection is the 1739 Assembly Bible, upon which generations of Pennsylvania’s elected leaders have taken their oaths of office. Friends Historical Library was established at Swarthmore College in 1871, two years after the College opened. Its collections document the history of the Society of Friends (Quakers) and the testimonies of Friends from the 17th century to the present. It is the largest Quaker library in the world and it includes materials on women’s suffrage, the rights of Native Americans, the anti-slavery movement, social activism, and the peace movement. The Abraham Lincoln Foundation of The Union League of Philadelphia (ALF) is the steward of an important collection of art, archives, manuscripts, books, pamphlets, objects and other historic documents related to both the Union League and the Civil War. The collections include not only the ALF’s collection, but also those owned by The Union League of Philadelphia, The Civil War Museum of Philadelphia, The Military Order of The Loyal Legion of the United States and The Dames of the Loyal Legion of the United States. The collections are available for research through The Heritage Center of the Union League. Additional collections of books related to American and European history, World Wars I and II, regional history, biographies and early 20th century travel are also available. The material collections housed at the Kislak Center include more than 350,000 books and 15,000 linear feet of manuscripts in a wide range of disciplines and formats, from medieval manuscripts to twenty-first century artists’ books. An ambitious program of digitization has resulted in hundreds of thousands of pages being placed online in its digital repositories, including OPenn, which hosts the diaries themselves.